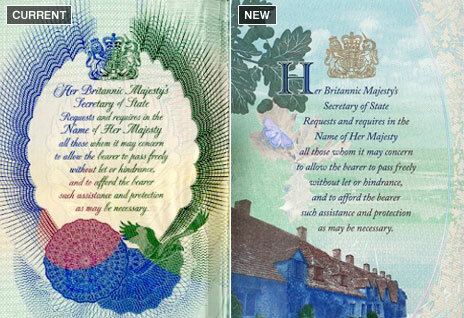 UK passports have been redesigned to help fight identity theft and fraud. The Home Office says enhanced security features include hiding the security chip from view, and a personal details section that features holograms. The personal details move from the back to the second page, and a photograph of the owner now appears twice. 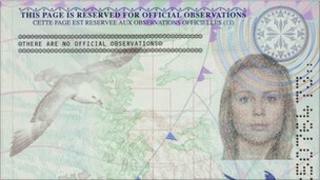 The passports will be issued from October. Pages will display well-known UK scenes including the White Cliffs of Dover, Ben Nevis and the Giant's Causeway. The government says the new passport will give UK citizens added protection from identity theft and fraud. The key difference between existing passports and the new ones is that the security chip - which holds owners' personal details - will no longer be visible, instead hidden within the inside cover. This, the government claims, will make it much harder to replace the chip without causing noticeable damage to the passport cover. To bring the UK in line with much of the rest of the world, the personal details section will be moved from the back of the passport to the second page. This is to help speed up travellers' passage through border controls. Other changes include printing another photograph of the holder on the observations page, and stretching designs across two pages rather than one. The chief executive of the Identity and Passport Service, Sarah Rapson, said: "Through its combination of physical and electronic security features, the UK passport remains one of the most secure and trusted documents in the world, meeting rigorous international standards. 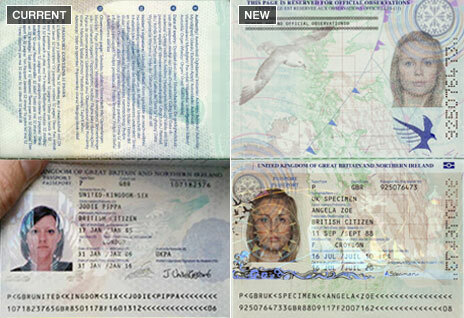 "The new design is part of our strategy to stay ahead of criminals who look to fraudulently alter or copy passports." The new passport will replace the version upgraded in 2006, which gained an electronic chip to comply with the US Visa Waiver Programme. 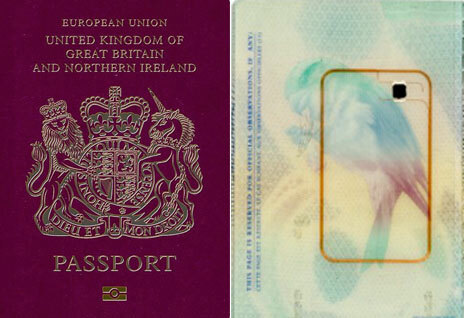 UK passports have contained an electronic chip with the owner's details since 2006. This will now be invisibly embedded in a thicker front cover, rather than in a separate page as pictured. It means the chip will be harder to replace without damaging the cover. 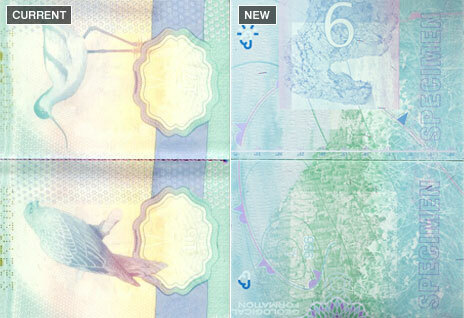 The passport holder's details are now spread over two pages with two images, one of which is covered with a transparent film containing holograms. It also now appears at the front of the passport, in common with other countries in Europe to help speed up passage through border controls. The inside pages now have a variety of 10 designs showing well-known UK landmarks including the Giant's Causeway (pictured right) which stretch across both pages. The paper used contains multi-coloured fibres which make it more difficult for anyone to copy. The inside front cover also has a new design - regularly changing the images and making them more detailed makes it harder for forgers to copy, although there's been no change in the wording, which still requests permission for the bearer "to pass freely without let or hindrance".